After months of waiting, Fortnite, the most popular game on the planet, is finally ready for its debut on Android. Unfortunately, when the news was first announced alongside the Galaxy Note 9's launch last week, there were a couple catches. First, Fortnite creator Epic Games said the game would not be available on the Google Play app store, and that to start, Fortnite for Android would be a limited-time exclusive for people with late-model Samsung phones. However, after just four days, that exclusivity is over. Epic has begun sending out invites to people with non-Samsung phones, according to multiple reports. So how do you get your hands on an invite yourself? The first step is to go to Fortnite’s sign-up page and enter you email. Epic Games will then ask if you have played Fortnite on any other platforms such as PC, iOS, Playstation, Xbox, or the Nintendo Switch, and if so, it will then ask you provide your login credentials, or create a new account if you don’t already have one. This is what the email with the link to download Fortnite looks like. From there, you will be asked to select your phone or tablet from a list of compatible devices that includes the Pixel 2, Essential PH-1, the Razer Phone, numerous LG G and V-series handsets, and more. 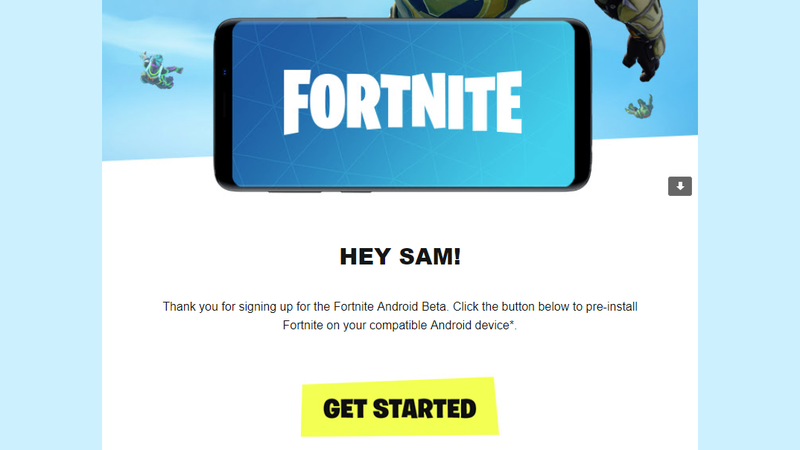 Then comes the hard part: Once you’re done registering for the Beta, you’ll just have to sit back and wait for the official Fortnite Android beta invite to show up in your inbox. In the meantime, you should get an email with a link to download the game and instructions on how to install Fortnite on your phone. 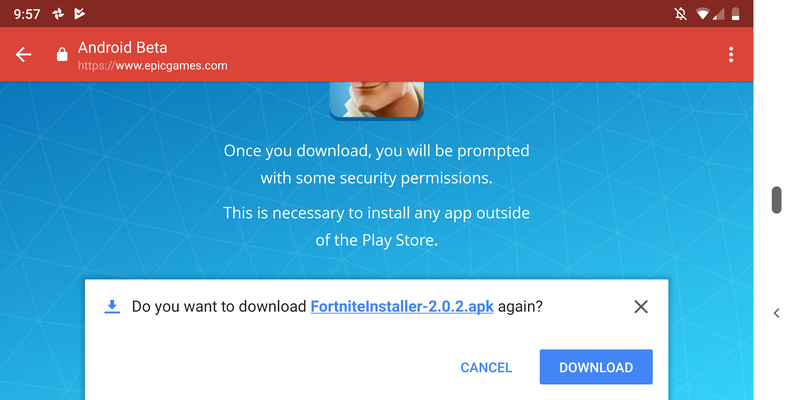 While this might sound a bit sketchy, since Epic Games decided not to host Fortnite on the Google Play Store, you will need to change some permissions on your to device so you can install the game. This is a process called sideloading that enables Android devices to install apps outside of the Google Play Store. It’ll look a little different depending on what device you have, but you’ll need to enable that toggle and another one for Chrome to proceed with the install. 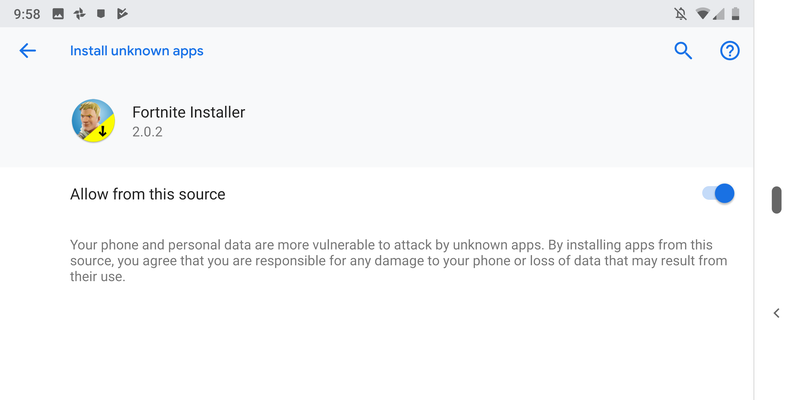 However, that means you won’t have Google looking out to make sure the install file is legit, so you should be extra careful to make sure you are installing the official Fortnite .apk directly from Epic. After you’ve finished the installation, you can change your phone’s permissions back to blocking software installs from third-parties. Before you install Fortnite on Android, you’ll also want to make sure your device has enough available storage to stash the game. Total file size is just shy of 2GB. Whew. Well that should be it – until your account is officially approved for the beta and you can start playing for real. For any Samsung phone owners who missed the boat, you should still be able skip most of this process and download Fornite from inside Samsung’s Game Launcher app. Then, it’ll be time to just drop in and get to battling. I’ll see you at Retail Row.